In 1978, Arnold "Arnie" Cunningham (Keith Gordon) is an awkward, unpopular teenager, in Rockbridge, California, with only one friend, Dennis Guilder (John Stockwell). Arnie's life begins to change when he buys a used, badly battered red-and-white 1958 Plymouth Fury, named "Christine," in need of extensive repairs. Arnie begins to restore Christine at a local repair shop and junkyard, Darnell's Autobody, but as he spends more of his time working on the car, he discards his glasses, dresses more like a 1950s greaser, and develops an arrogant personality. 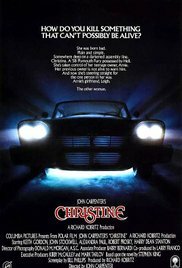 Dennis and Arnie's new girlfriend, Leigh Cabot (Alexandra Paul), discover the car's previous owner was obsessed with Christine and committed suicide in it by carbon monoxide poisoning. Read more on Wikipedia.